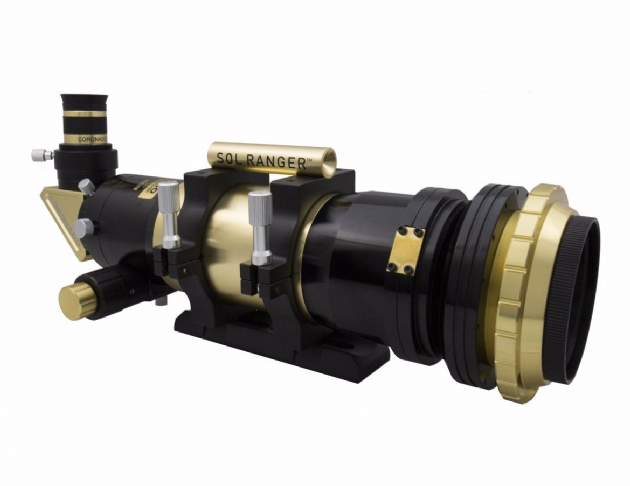 The new Coronado 70mm SolarMax III series telescope with enhanced rack & pinion focuser and large external etalon(s) are now the perfect way to view the Sun! The SM3 70mm comes with an included 18mm CEMAX eyepiece, Sol Ranger™ Solar Finder, Vixen-style dovetail mounting rail, and an all-new black and gold Aluminum Hard Carry Case.This very high quality 70mm solar telescope features an 400mm focal length, f/5.7 focal ratio, and 15mm blocking filter. Includes mounting rings, Cemax 18mm eyepiece, Sol Ranger solar finder and black & gold aluminum hard carry case. Assembled Product Weight 7.6 lbs.